Included are representations of four US legislative documents in Akoma Ntoso format, named after their corresponding FDsys files: 112hconres83eh.akn.xml, 112hr4310enr.akn.xml, 112hr1eas.akn.xml, 113hr1120rh.akn.xml. Each validates against the latest version of the Akoma Ntoso schema: 3.0/CSD06. They were generated by a script that I will submit in the following, data mapping contest. Also included is a stylesheet that allows these Akoma Ntoso documents to resemble their originals when viewed with a modern web browser. 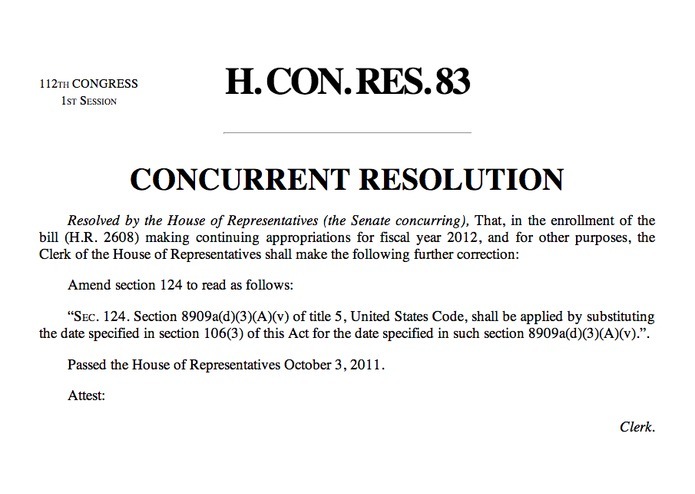 I use Akoma Ntoso’s element to represent the concurrent resolution, H.Con.Res. 83, even though concurrent resolutions do not follow the same procedure or have the same force of law as bills. Perhaps a new Akoma Ntoso document element should be considered. I was unsure which Akoma Ntoso element should be used to mark the reference to report 113-30 at the beginning of H.R. 1120. It calls for something like the converse of the element, which identifies “the document for which this document is a report of.” A simple element might work, but it seems insufficient to capture the importance of this reference. I use a element, although this use may be incorrect. I use the html element wrapped in a element for the horizontal lines in H.Con.Res. 83 and H.R. 1120. A native element might fit naturally in Akoma Ntoso, which already contains other html elements, such as and . I represent the hierarchical structure in the amendment to H.R. 1 using nested Akoma Ntoso elements, although I’m not sure this solution is entirely satisfactory. The tables at the end of the enrolled bill are complex. Their rendering in Akoma Ntoso would benefit from elements that group table rows, such as html’s and . Finally, it would be nice to have inline elements within elements to designate section numbers, page numbers, etc.